PhotoFiltre HD is a simplified version of PhotoFiltre, but it uses a native HD core. Each pixel is stored in 128 bits (32 bits for each RGBA channel) which allows a maximum calculation precision. The screen display uses a RGB 24 bits conversion in real time (fast tone mapping). This method keeps the image in HD format (in the memory) and it is not necessary to perform rounding calculation between each filter. There is no loss in applying a series of filters. Each pixel retains its value calculation with decimal precision. 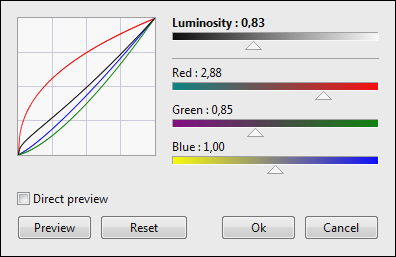 Most adjust filters display RGB curves in real time. I think it helps to better understand the filter effect. The import/export uses FreeImage library under the public license (read the license text file included with the software). I chose this library because it support lot of image formats and because it has an interface for Delphi language. The FreeImage dll has a big size but can be updated separately. For the moment it is a first beta under development. Do not expect to find all standard functions. I do not know how fast it will evolve. The beta version is english only. PhotoFiltre HD requires a registered version of PhotoFiltre Studio X ! Here is the beta version in zip format (2.3 MB). Create a new folder on your PC to unzip the files. - Some new filters like Unsharp mask and Micro details. - New merge HDR mode (Weighted). Better result for shadows and highlights. - Local (bilateral) tone mapping. Add more details but more grain too. Use only if needed. This is the new plugin? I make new directory in the PhotoFiltre Studio folder. That's enough? 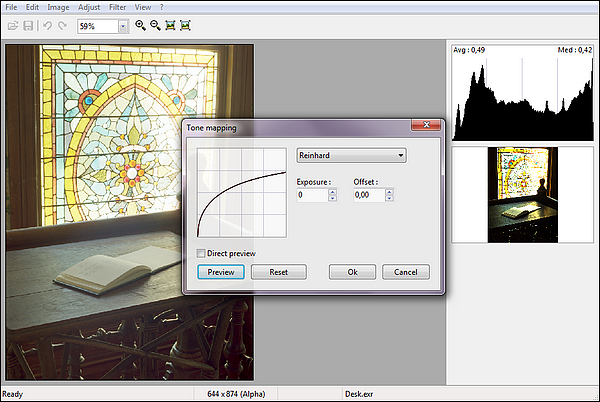 If you would include the HDR function in PhotoFiltre Studio can translate all strings. I have got now again Internet.